Today is a very sad day for me as I say goodbye to one of my most beloved literary series. For our wedding anniversary, the Runtherd bought me Sergei Lukyanenko's latest Watch instalment on its day of release. I discovered the Watch series rather late on in their publication lines in 2006 and very swiftly chewed through the first three books (Night Watch, Day Watch and Twilight Watch) in a matter of days. Back then, they were still referred to as the Night Watch trilogy, so after I finished the third book (Twilight Watch), I put it down with a distinct feeling of glowing satisfaction, knowing absolutely that this had become one of my favourite literary trio. When I found out that a fourth book (The Last Watch) had been released in 2008, I can say shamelessly that I practically wet myself with excitement. 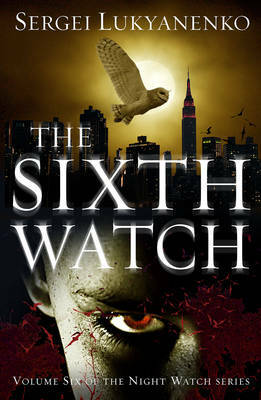 From that day on, I kept one eye on the horizon, so I knew that The New Watch and, subsequently, The Sixth Watch were being published well in advance. I cannot express in words just how much this series has filled me with reading pleasure and the series remains close to my heart (being choc-full of Russian folklore, it's perhaps not that surprising). So when I closed The Sixth Watch, having read the epilogue with an aching sense of 'this cannot be the end', please imagine how cold my heart became when I later read (from none other than the man himself) that this was indeed Sergei Lukyanenko's final book in the Watch series, with no more to follow......ever. So, RIP to one of my most favourite literary series, but that still won't stop me from flying your pennants and urging anyone who will listen to read you with a fiery enthusiasm. I didn't even know these were books to begin with, I really enjoyed the first movies. On the other hadn there are plenty of cool stuff to discover ahead !